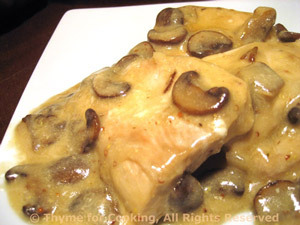 Turkey Cutlets with Creamy Mushroom Sauce, Thyme for Cooking main course. Add cumin, mushrooms and sauté until mushrooms start to brown. Move to the side and add turkey cutlets. Lightly brown on each side, about 5 minutes. Stir in mustard, chicken stock and simmer, uncovered, 5 minutes. Add yogurt, stir to combine and serve.